Discover a hand-picked selection of cabin resorts, rentals, and getaways in Mammoth Lakes, CA. Featuring 1 and 2 bedroom condos with lofts, these units are well-located to everything in town. With only 2 units per building, this condo resort is quiet and modern. 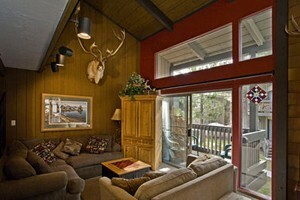 Comfortable cabins on the June Lake Loop with kitchens, 32"tvs & wifi. Some have fireplaces and some are pet friendly! Open year round. ~your best value and hospitality! Pet Friendly rooms only steps away from June and Gull Lakes. Apartment-style units with kitchens, dinettes with views and fireplaces. 1, 2 & 3 bedroom cottages with fully equipped kitchens, nice living rooms, wifi, cable & private decks. Group area includes fire pit, bbqs, fish sink & laundry. Pet Friendly! Pet friendly motel rooms and cabins right in June Lake Village. Year-round retreat overlooking Crowley Lake. Hunting, fishing and only 15 minutes from Mammoth Mountain Ski Area. Motel rooms, housekeeping units and townhomes. Vintage 1950's cabins a short drive to the lifts and town with a quiet wooded location. Full kitchens, Dog Friendly and easy parking. Bring your pet to Mammoth Lakes, California.